Every year, the trade magazine Drinks International puts out a of the top-selling alcohols in the world, and in the category of spirits, there is one brand that more than doubles the sales of its closest competitor every year. Smirnoff, Jack Daniel’s and Bacardi don’t even come close. 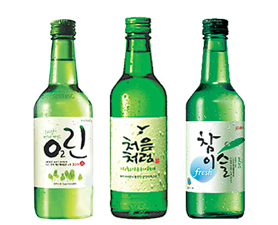 That top-seller is South Korea’s Jinro soju, a clear spirit traditionally made of rice. It’s about 20-percent alcohol and has a light, slightly sweet taste. The reason you’ve probably never heard of it is because Jinro does less than 5 percent of its sales in the U.S. It makes up for that by dominating the market in South Korea, and doing brisk business in Japan and China. Now, Jinro’s American operation wants to expand, and it’s getting some help from a major spokesperson — Korean pop star PSY, whose “” music video is now closing in on 2 billion views. “The Korean culture is now becoming the hip culture,” says Patty Kang, who runs advertising strategy for Jinro America. Kang, who is herself Korean-American, she says she recently saw this play out at a K-Pop concert in L.A.
And, of course, Kang says, Korean-Americans are already sold on Soju.